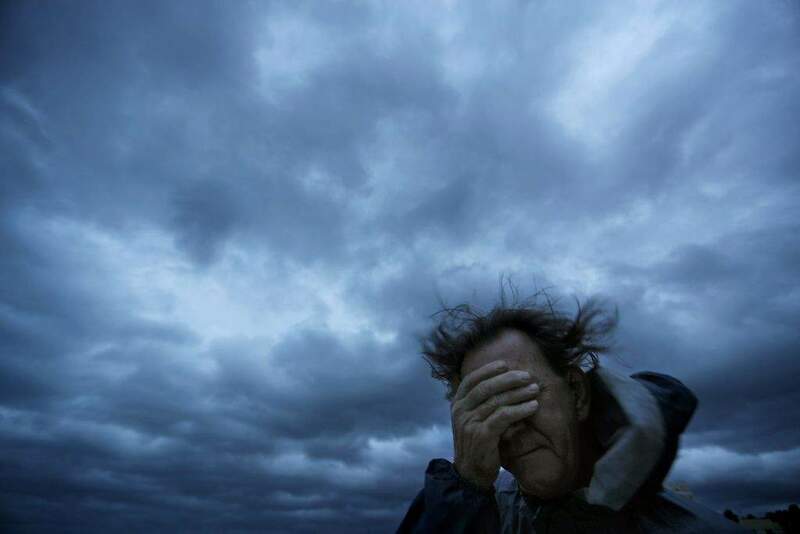 Associated Press: Russ Lewis covers his eyes from a gust of wind and a blast of sand as Hurricane Florence approaches Myrtle Beach, S.C., on Friday. WILMINGTON, N.C. -- Hurricane Florence rolled ashore in North Carolina with howling 90 mph winds and terrifying storm surge early Friday, trapping hundreds of people in high water as it settled in for what could be a long and extraordinarily destructive drenching. At least three people were killed. More than 60 people had to be pulled from a collapsing cinderblock motel. Hundreds more were rescued elsewhere from rising water. Others could only wait and hope someone would come for them. A mother and baby were killed when a tree fell on a house, according to a tweet from Wilmington police. The governor's office said a third person was killed while plugging in a generator. The biggest danger, as forecasters saw it, was not the wind but the water -- the storm surge along the coastline and the prospect of 1 to 3 1/2 feet of rain during the next several days that could trigger catastrophic flooding in a slow-motion disaster well inland. By early afternoon, Florence's winds had weakened to 75 mph, just barely a hurricane and well below the storm's terrifying Category 4 peak of 140 mph earlier in the week. But the hurricane had slowed to a crawl as it traced the North Carolina-South Carolina shoreline, drenching coastal communities for hours on end. 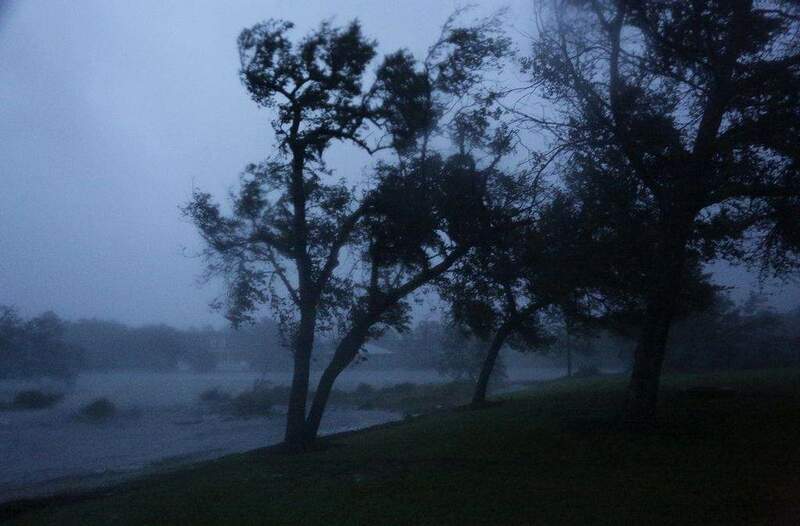 The town of Oriental had gotten more than 18 inches of rain just a few hours into the deluge, while Surf City had 14 inches and it was still coming down. "Hurricane Florence is powerful, slow and relentless," North Carolina Gov. Roy Cooper said. "It's an uninvited brute who doesn't want to leave." Cooper said the hurricane was "wreaking havoc" on the coast and could wipe out entire communities as it makes its "violent grind across our state for days." He said parts of North Carolina had seen storm surges -- the bulge of seawater pushed ashore by the hurricane -- as high as 10 feet. Florence made landfall as a Category 1 hurricane at 7:15 a.m. at Wrightsville Beach, a few miles east of Wilmington and not far from the South Carolina line, coming ashore along a mostly boarded-up, emptied-out stretch of coastline. It was expected to begin pushing its way westward across South Carolina later in the day, in a watery siege that could go on all weekend. Authorities warned, too, of the threat of mudslides and the risk of environmental havoc from floodwaters washing over industrial waste sites and hog farms. Florence was seen as a major test for the Federal Emergency Management Agency, which was heavily criticized as slow and unprepared last year for Hurricane Maria in Puerto Rico, where the storm was blamed for nearly 3,000 deaths in the desperate aftermath. Meteorologist Ryan Maue of weathermodels.com said Florence could dump a staggering 18 trillion gallons of rain during a week on North Carolina, South Carolinas, Virginia, Georgia, Tennessee, Kentucky and Maryland. That's enough to fill the Chesapeake Bay or cover the entire state of Texas with nearly 4 inches of water, he calculated. The Wilmington airport had a wind gust clocked at 105 mph, the highest since Hurricane Helene in 1958. 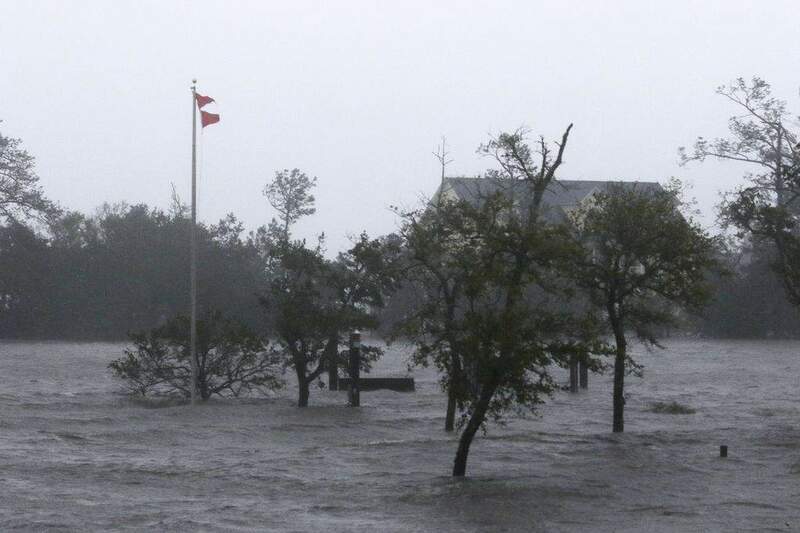 In New Bern, population 29,000, flooding on the Neuse River trapped people, and Mayor Dana Outlaw told The Charlotte Observer that about 200 had been rescued by 5 a.m. Residents reached out for help through the night by phone and social media. Tom Balance, owner of a seafood restaurant in New Bern, had decided against evacuating his home and was soon alarmed to see waves coming off the Neuse and the water getting higher and higher. Six sheriff's officers came to his house to rescue him Friday morning, but he didn't need to leave since the water was dropping by then. Still, he said: "I feel like the dumbest human being who ever walked the face of the earth." "Very eerie, the wind howling, the rain blowing sideways, debris flying," said Orsa, who lives nearby and feared splintering trees would pummel her house. More than 12,000 people were in shelters in North Carolina and 400 in Virginia, where the forecast was less dire. Officials said about 1.7 million people in the Carolinas and Virginia were warned to evacuate, but it was unclear how many did.